When the Burnaby School Board began debating Policy 5.45, a sexual orientation and gender policy, no one I knew noticed or cared. All of a sudden – out of nowhere – a group no one had ever heard of opposed the policy. They stacked the school board meetings. 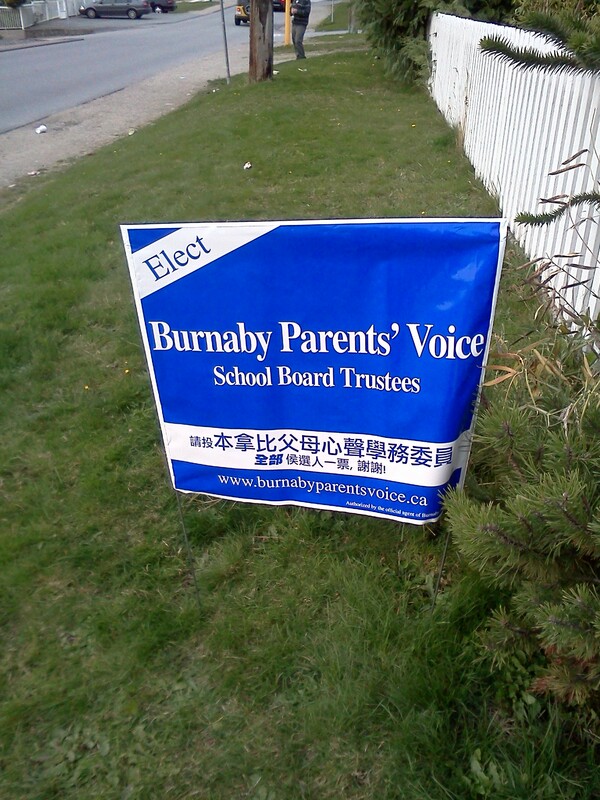 They called themselves Burnaby Parents’ Voice and claimed to be speaking for Burnaby parents. (Note: their original website, which was created to oppose Policy 5.45, has since been removed). They felt the school board had a ‘homosexual agenda’ and that the policy would interfere with their religious beliefs, beliefs that included, among other things, the thought that life begins at conception. On the website that has since been removed, there was a form letter to be given to school principals requesting that they respect their students’ religious beliefs and not teach them anything that opposed these. Stunned, a few parents got together on Facebook and created a group to oppose BPV and support Policy 5.45. Within a few weeks it had over 100 members. The first order of business: rallying in support of Policy 5.45. School board elections were coming up. Burnaby Parents’ Voice decided to run a slate of candidates. There was no longer any mention of homosexual agendas or opposition to Policy 5.45 on their website. A right wing Christian website called Roadkill Radio/Culture Guard endorsed them. Interestingly, there is no link to this website on the Burnaby Parents’ Voice website. On Roadkill’s website, BPV candidates claimed to be the targets of hate attacks from 5.45 supporters. I found myself wondering if this was what happened when traditionally religious people felt threatened: the website was rich in hatred, paranoia, and fear of the society around it. It was during their campaign that I realised my neighbour was a BPV candidate. She was out on the street with a pile of BPV signs, busily putting them up in our neighbours’ front yards. I was so upset that I followed her down the street and confronted her. I couldn’t believe that this person I thought I knew, who had babysat my child, who I believed to be a kind and caring person, could be so bigoted. We had a long conversation. I could tell she was surprised that I didn’t agree with her, but she was mature enough to listen as I ranted about the importance of 5.45. It was clear, though, that we could never agree. For the first time I really confronted the depth of the divide between us and within the community. This was not going to be easily solved. She and I were literally looking at the same thing and seeing something totally different. Our minds were different. It was hard to see where there could be middle ground. She felt the government had too much power over children’s education and that BPV was misunderstood. I felt the government was doing the right thing and that BPV was a party of bigots. There was a cavern between us. How strange it was to realise we were foreigners to each other. I went on Facebook and told everyone I knew not to vote for BPV. I was convinced they would win. They had signs up all over Burnaby and they appeared organized. But they lost. The incumbent trustees won in a landslide. We thought this might be the end of BPV, but we were wrong. Recently my child’s school did a dance to the Lady Gaga song “Born This Way” to support anti-bullying day. The BPV immediately went to the media to state their opposition to the video the schools made. Kate was one of the early Empresses but has since retired from this collaboration. She used to write from VANCOUVER, Canada.